ROMANS 10:10 KJV "For with the heart man believeth unto righteousness; and with the mouth confession is made unto salvation." 7Or, Who shall descend into the deep? (that is, to bring up Christ again from the dead.) 8But what saith it? The word is nigh thee, even in thy mouth, and in thy heart: that is, the word of faith, which we preach; 9That if thou shalt confess with thy mouth the Lord Jesus, and shalt believe in thine heart that God hath raised him from the dead, thou shalt be saved. 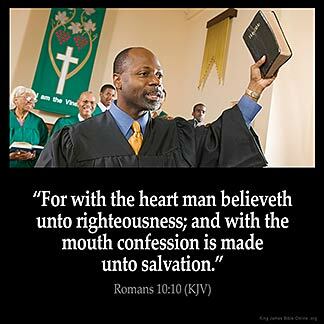 10For with the heart man believeth unto righteousness; and with the mouth confession is made unto salvation. 11For the scripture saith, Whosoever believeth on him shall not be ashamed. 12For there is no difference between the Jew and the Greek: for the same Lord over all is rich unto all that call upon him. 13For whosoever shall call upon the name of the Lord shall be saved. For with the heart man beleeueth vnto righteousnesse, and with the mouth confession is made vnto saluation. For with the heart man has faith to get righteousness, and with the mouth he says that Jesus is Lord to get salvation. For with [the] heart is believed to righteousness; and with [the] mouth confession made to salvation. For bi herte me bileueth to riytwisnesse, but bi mouth knowleching is maad to helthe. 10:10 For with the heart - Not the understanding only. Man believeth to righteousness - So as to obtain justification. And with the mouth confession is made - So as to obtain final salvation. Confession here implies the whole of outward, as believing does the root of all inward, religion. Ro 10:10 For with the heart man believeth unto righteousness. Such a belief, the faith that saves, is a power over the life. It influences the actions and brings us into "the obedience of faith", in yielding to Christ, wherein is found pardon. With the mouth confession is man unto salvation. The faith of the heart must be openly confessed. This is a test of the faith. Unless Christ had provided such tests as confession and obedience we could not know whether ours was really a belief of the heart. That our faith moves us to confession is to us an assurance of salvation. The whole Christian life is a confession. If I listen to my mind : My mind would talk me out of the Blessings of God. In order to obtain what God has : As I hear and observe His word : I believe with my heart and automatically I speak with my mouth : God gave me a mouth to use and I choose to use it in accordance with His word. God spoke and it was : So am I to speak and it is. I have it in my heart then when I believe it I will speak it then the manifestation will come. No matter how long it takes to manifest : as long as I stand continually on His word I will see. Believing is seeing . Praise God !!! It is from the abundance of the heart that the mouth speaks.The mouth speaks from what is in the heart. Salvation can not be obtained without rightousness. The 'walk' "Must" match the 'Talk'! He who says he has the light but lives in darkness is a lier. Remember God Himself said "...my people worship me with there mouth but there heart is far from me...". Amen. Here is a verse which teaches that twofold evidence of salvation. First, when God saves a person, they believe in their hearts, which is really in their spirit essence. They receive their resurrected souls at the moment of salvation. (Ezek 36:26 KJV) A new heart also will I give you, and a new spirit will I put within you: and I will take away the stony heart out of your flesh, and I will give you an heart of flesh. Secondly, a person who truly believes in their heart, will be unable to keep it to themselves and will become a verbal witness and tell others about the Lord. Jeremiah wanted to stop bringing the word of God to Judah but he could not because it was as a fire in his heart. (Jer 20:9 KJV) Then I said, I will not make mention of him, nor speak any more in his name. But his word was in mine heart as a burning fire shut up in my bones, and I was weary with forbearing, and I could not stay. The mouth confesses what the regenerated heart has believed.